This way, the library encourages users to choose more books, and users get help finding new authors without even having to bother the librarians. And without even having to bother doing research. It’s a win-win proposition. Amazon does something similar when you look for a book. If you go to URL to buy my book on happiness, you will get suggestions for similar books that others have purchased along with mine in the past. This is not just a book marketing tactic. It can be, and often is, applied across many different niches and venues. You’ll see on my blogs I often do this. For instance, at http://thehappyguy.com/use-protein-shakes/ you will see me refer also to http://thehappyguy.com/protein-powder-not-just-for-shakes/. This is a great way for me to introduce new visitors to a little more of the blog, similar posts that presumably will interest them. There are numerous plugins for “related posts”. I prefer to do this manually; that’s just my preference. But a plugin is good, too. Twitter is very good at suggesting people I might like to follow, based on whom I am already following or have recently followed. 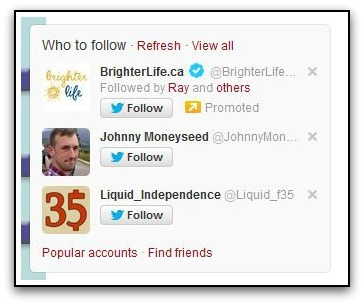 Of course, that assumes that Twitter can get inside my head (it can’t) to figure out why I follow the people I do. But they do try. So what can we learn from the Ottawa Public Library and Amazon.com? The take-away for marketing writers is that when you write marketing text, it is worth paying attention to what related items the buyer, reader, subscriber or other “er” might be interested in. By recommending related items, you are performing a valuable customer service while at the same time increasing sales. The take-away for authors is that you might better market your book by teaming up with a similar author or even several similar authors. Instead of viewing other authors as competitors, why not view them as collaborators. For instance, imagine printing a bookmark with three mystery novel covers on it. 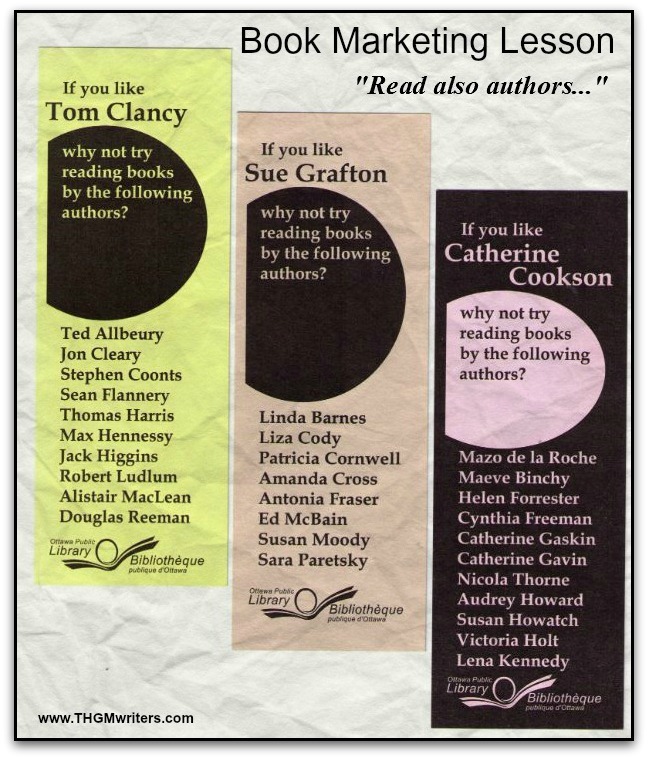 Three authors handing out the bookmark, three authors benefiting from each others’ referrals. And that is just the beginning. There is no reason not to do additional collaborations, especially if the three authors are doing book tours in three separate geographic regions. But this can also be done on virtual book tours. The cost in time and money can be so much less when shared among 3-5 authors. In fact, I would love to organize some joint online promotion for a group of similar-niche authors; if anyone is interested just let me know. Thank you David for the wonderful article! I found this so enlightening. I would love to try the bookmark ideas with other authors in my genre. I write mystery/suspense, do you have any ideas of someone that would like to join me? Also, how do you create a virtual book tour? related content to another person in a niche all the time! Shared this and keep it up!